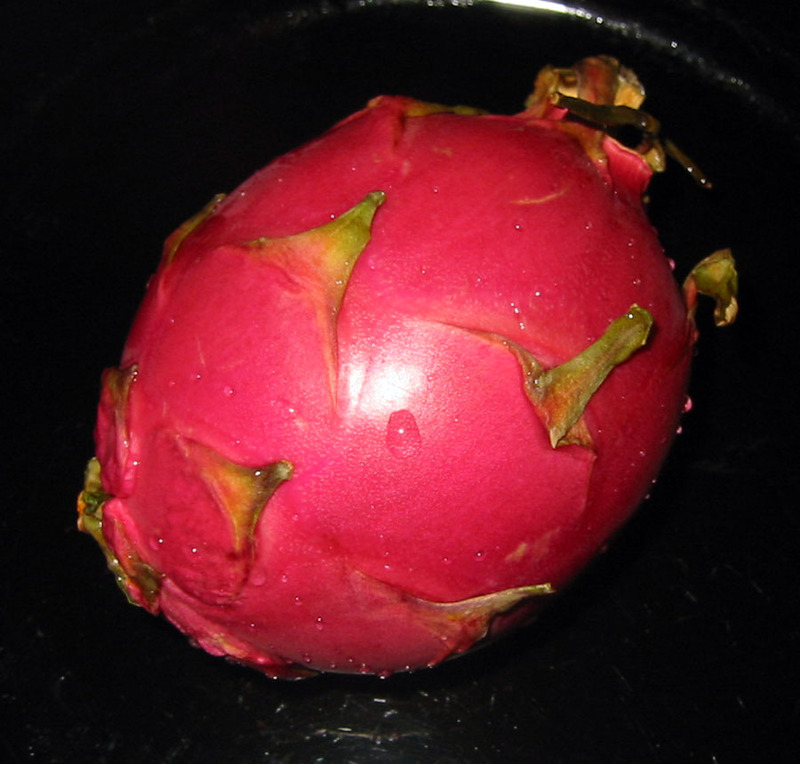 I was so lucky to find this DRAGON FRUIT at my local grocery store. Most average grocery stores in Nashville have limited produce, and it is hard to find anything different from apples, oranges, bananas, grapes, onions, potatoes, lettuce and other boring salad stuff, broccoli, cauliflower, squash, and few other standards. Even the Wild Oats is limited, and does not carry "exotic" fruit. To find any veggie or friut that is interesting, and not a typical for the USA, my local Harris Teeter Grocery Store seems to come through for me. Harris Teeter is only in a few southern states (MD, VA, GA, SC, NC and TN), yet it seems as though my local Harris Teeter in Nashville does a great job in getting a great variety of fresh produce. Here is my Dragon Fruit, and it cost me $4.99 plus tax for a total of $5.40. Yup, I paid that much for a fruit the size of fist. I took it home, looked at it for days on my counter. I just am amazed at the vibrant pink color. This fruit I brought home is not as fresh as the ones I saw in New York, but beggers cannot be choosers. I took this fruit home and hugged it! I was so excited to finally taste this pretty in pink fruit! 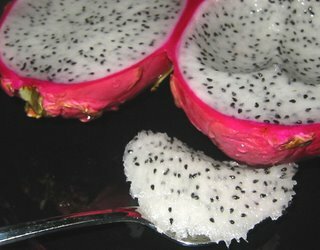 I sliced it open and saw a lovely white fruit with little specks of black seeds all in it. The white and black colors were such a nice contrast to the pink skin. I could not wait to taste the fruit, so I grabbed a spoon, and I was going to just dig in like one would do with a cup of ice cream. 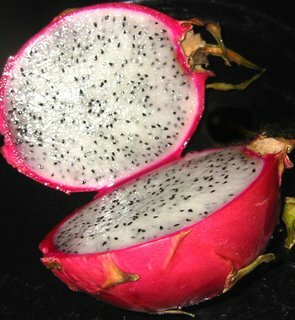 The texture of the black seeds is like the seeds of a strawberry, and the texture of the white fruit is like a denser watermelon. There is some liquid in the fruit like a watermelon but not as juicy as a watermelon, so there was nice slicing -slushy sound when my spoon scooped out a bite of the fruit. The tiny black seeds made a nice crispy sound in my ears as I chewed the fruit. The flavor was not too sweet with a jicama flavor, and the quality of the fruit is very refreshing. I was able to eat every last bit of the white fruit down to the pink rind, unlike a cantelope that has a green layer between the orange flesh and the tough rind that you don't want to eat. I am going right by the Harris Teeter today, so do I dare spend another $5.40 on a single fruit, or do I go and buy 6 apples for the same price and have a piece of fruit for nearly every day of the week? 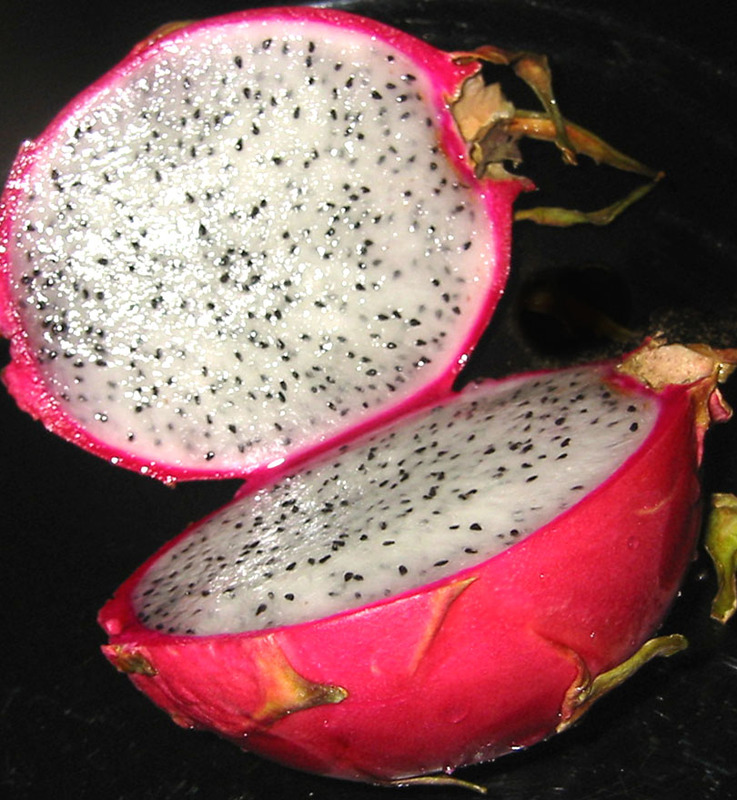 Oh, I had just an enjoyable and luxurious experience eating my pretty in pink fruit. Do I dare spend again? Supposedly, the best hotel in Nashville is the Loews - Vanderbilt. It was built in the '80s, with valet parking, one bar, one restaurant, and Ruth's Chris Steakhouse next door. There is also a ballroom where many political fundraisers are held. I don't know much about those fundraisers because most fundraisers are $100s or $1000s, and that isn't how I would want to spend my limited funds. I prefer to spend my money on excellently made food, from a simple apple to homemade ziti. When Ohio Ma and Pa came to town, they wanted to stay at the Loews because they got a really great weekend special! 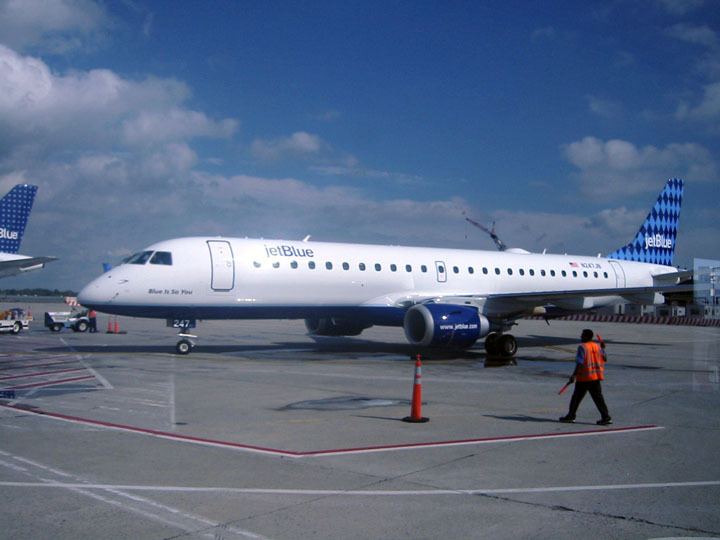 It really serves travelers well to call hotels directly to see if there is a special that is not advertised or on the internet, and sometimes there is a manager's special that can only be obtained by phone. Ohio Ma and Pa wanted to grab a quick breakfast before driving off into the sunshine, and they said it would be easiest to come by the Loews. 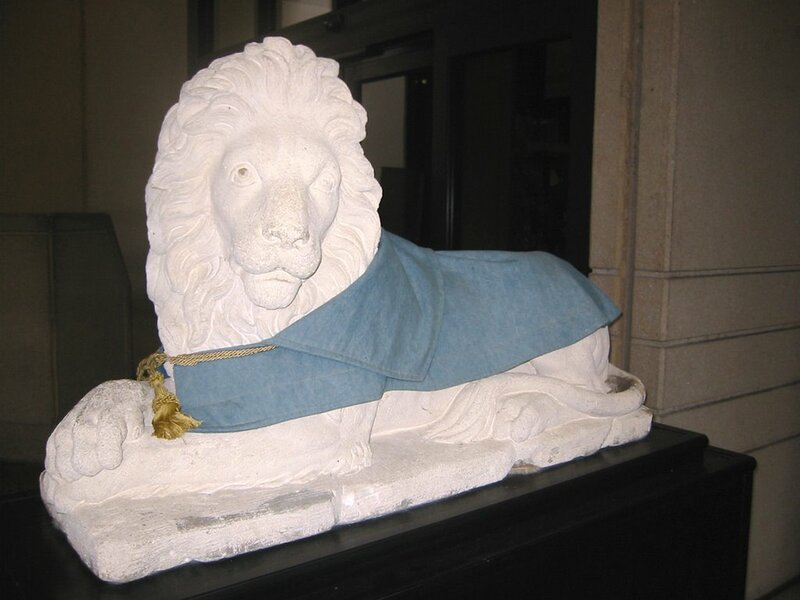 What we saw at the entrance of the Loews was a set of concrete lions. The Valet told us that they have many capes for the lions, and everyday they put on different capes on the lions depending on what the lions may like for the day. This day was demin with a gold cord. We went into Loews, and they have a naming convention for their restaurant and bar that I actually like. The bar is called DRINK, and the restaurant is called EAT. Simple, straight forward, and appropriate. The night before, we spent time in DRINK, and the wait staff was very good, and we were never thirsty. In the morning, we went to EAT for breakfast. There was a huge room for a brunch buffet, and there is a menu. I think the brunch buffet was $35, and it included many warming trays of lunch foods, a carving station for roast beef and ham, omlettes made to order, chilled shrimp and mussels, fruit, and dessert. There had to be at least 100 items to choose from. The cost of the buffet was a bit steep, so we opted for the menu. I got a REALLY GOOD dish. I got Eggs Benedict Loews style. 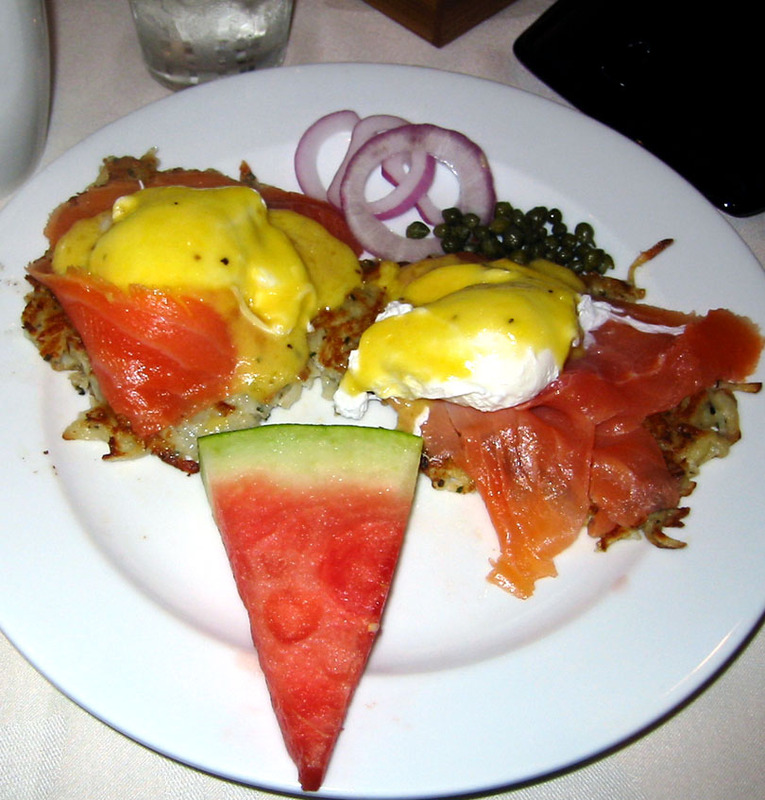 The poached eggs were lightly covered with a Hollandaise sauce, over lox, over a crispy herb potato pancake. Fantastic! I have never had breakfast like this! The potato pancakes were crispy on the outside, and light on the inside, with a nice flavor. 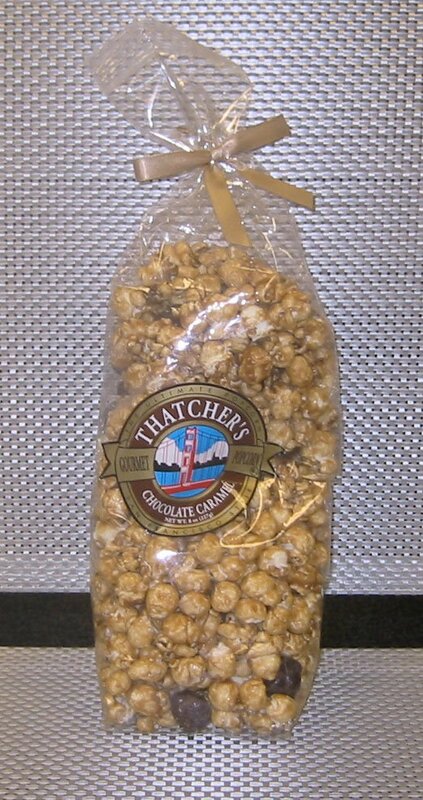 I did not share them with anyone at the table because I was hoarding them, as they were so good. I would have never thought of putting eggs benedict on top of potato pancake. It was so much better than the buffet because some of the buffet food looked like it was sitting around for a long time, but my plate came out freshly made and hot. 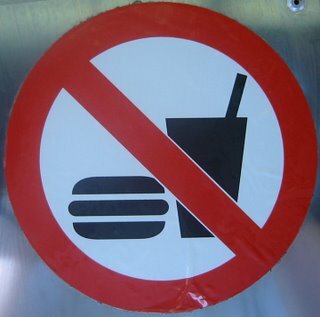 I used to never go to USA hotel restaurants because I always thought that hotel restaurants are bad. Back in the day, USA hotel restaurants did not represent well because they didn't have to because they had a captive audience (hotel guests) who had no choice but to eat food at the hotel. Since hotel restaurants could serve scum and still make money, why would they spend time, money and energy to make their food any better than they had to for turning a profit? Well, since about 5 -10 years ago, I think that some of the hotel restaurants nation-wide have taken a turn for the better because hotel guests can just go somewhere else, and the hotel restaurants have to compete for the clients. I think the Loews EAT breakfast follows the trend that hotel restaurants need to deliver or lose the market share, and Loews EAT delivered a very nice breakfast to me! The weekend is tough to eat out in Nashville. It seems that everyone waits for Friday and Saturday to go out, and restaurants are fairly empty Tuesday through Thursday, and many restaurants are closed on Sunday. So, myself and friends were looking for a place to eat dinner around 9 pm after gallery hopping, so we were hungry and thirsty! What we found was that everywhere was packed! We found ourselves in the new "hip" area of 12th South and looking at a very long wait at Mirror, so we strayed acrossed the street into the 12 South Taproom. At any one time while in the 12 South Taproom, we were only one table of 2 or 3. I am not quite understanding why this place isn't more packed, besides being in a location that is "cursed". OK, so the location is not really cursed, but businesses never do well in the location. This place has plenty of parking, it is and open floor plan, there are 22 beers on tap, and there is one fresh rootbeer on tap as well. There are a couple of TVs with the latest game on, and there is table and bar seating to your liking. The two restaurant and bars flanking this place were rocking, and had no room for us, so that is how we ended up at the 12 South Taproom. The food was actually very good, and Inexpensive! Look at these simple, but tasty chicken tacos made with fresh tortillas. I like this lighter take on bar food tacos. This is a half sized salad, and it was very fresh and tasty too. The salad came with a fresh made balsamic vinagrette, crumbled blue cheese, pecans and strawberries. 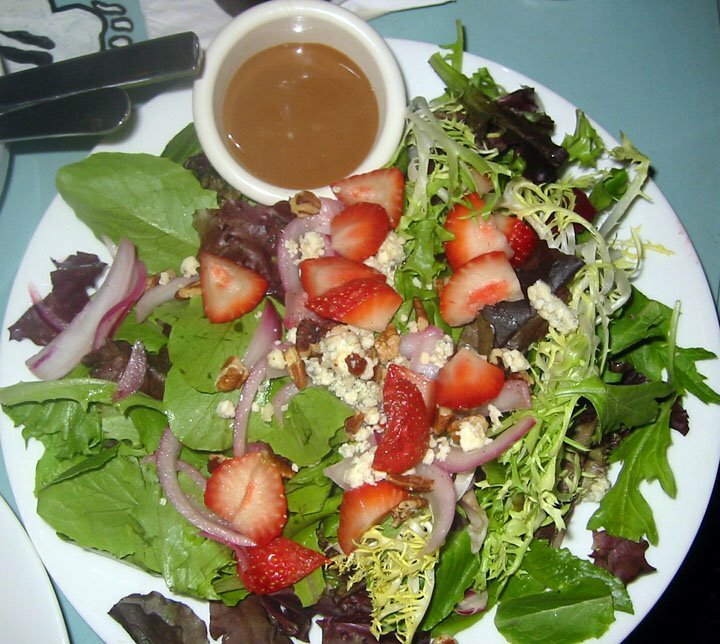 The waitress told us that all salads are dinner sized, but all salads are available in half size and half price if it is too much. That is what I did, I got a half size salad that was a very good size. 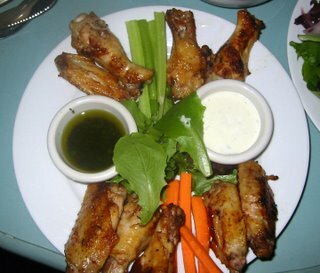 Thes wings were great! They are not standard hot wings, rather they are baked and grilled. 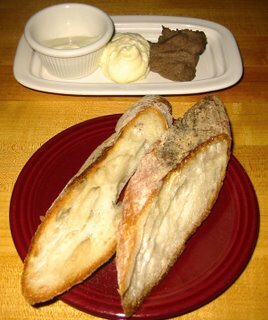 The sauces are a standard ranch dressing, and the lovely surprise sauce is an olive oil and herb sauce. 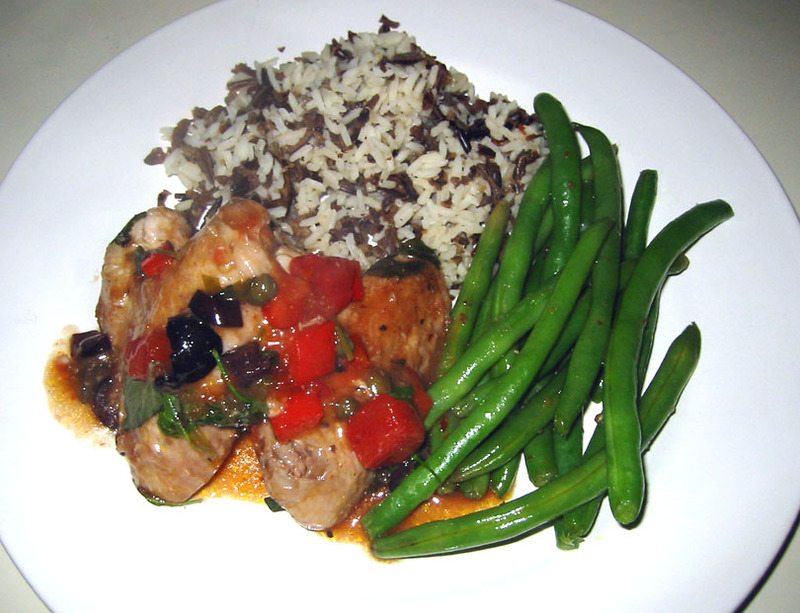 The herbs are fresh, and was so tasty! It was nice to not have the traditional frozen hot wings that come from Sysco food distributors. I LOVE THESE WINGS! I am really impressed with this place. 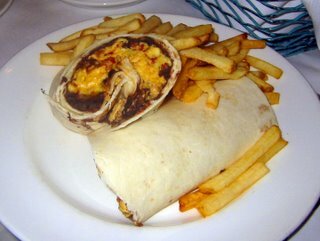 I love the non-traditional bar food, and there are lighter options with a hint of our favorite bar food. I love all the beer and rootbeer on tap. I am still wondering why it is not as packed as I think it should be. Why is it that people are not flocking there for good beer and good food? Is it the curse on the location, or what? We are home again, and the first frost is coming. It is unseasonably cold here in Nashville, so I had to harvest the last bits of my herb garden this past weekend. I grew parsley, sage, rosemary and thyme; I also grew ginger, garlic chives and oregano. I have given up on the basil because I do not have enough sun. 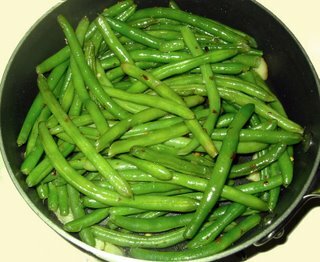 I made sauteed green beans with red chili, garlic and olive oil. I made a Giada dish with skinless organic chicken thighs, browned then braised in our own Napa Merlot, olives, tomato, garlic, onions and crushed red peppers. 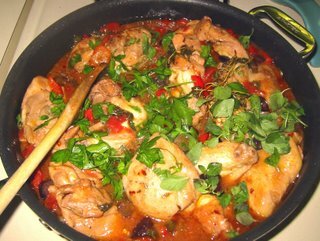 To finish, I added my own organic oregano, thyme and parsley. Yumm-O! I grew all my organic seedling herbs in potting soil and organic fertilizer from the Gardens of Babylon (Farmers Market, 8th Ave North, 615-244-8949), and not one herbicide or pesticide. The boys, Marc and Matt, young owners of the Gardens of Babylon, started many heirloom plants in an organic manner. I am a complete convert to these organic plants from my garden because they were extremely hardy this year, and I can feel good about eating these foods and herbs. This all reminds me that I need to buy my winter flowers now (or last week). I cheated on the rice. 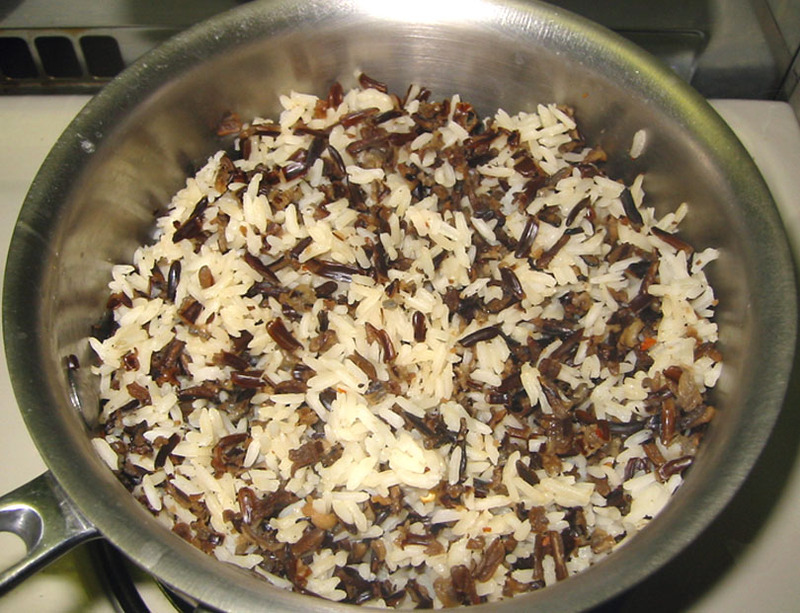 I did not have time to cook wild rice, so I got the instant kind that cooks up in about 20 minutes. 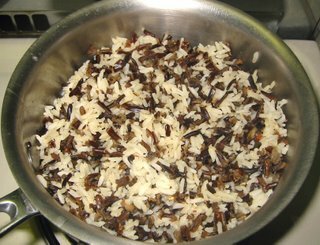 I mixed it in with some jasmine rice, which cooks up in just about 20 minutes (hey! neato), and both cooked up at the same time. Here is one of our dinner plates. Pretty huh? Here are three kinds of apples I got. I now forgot the varieties, but I think I liked the middle one the best. The other 2 were a bit sour. When we started our trip from Nashville, our BNA airport terminal food kiosk was a bit weak on the food. The hope was for a hot breakfast plate to enjoy at gate, but when we got to the counter, after 10 am, but before noon, there was not one drop of hot food to be had. The under-paid, could not care less, clerk said there is no food because it is not breakfast or lunch time, come back in an hour. In an hour, I was going to be a plane eating plane snacks. Needless to say, we were feeling a little burned, and a little hungry. On our way back from New York, we flew out of JFK. We were in a temporary terminal with temporary food kiosks. 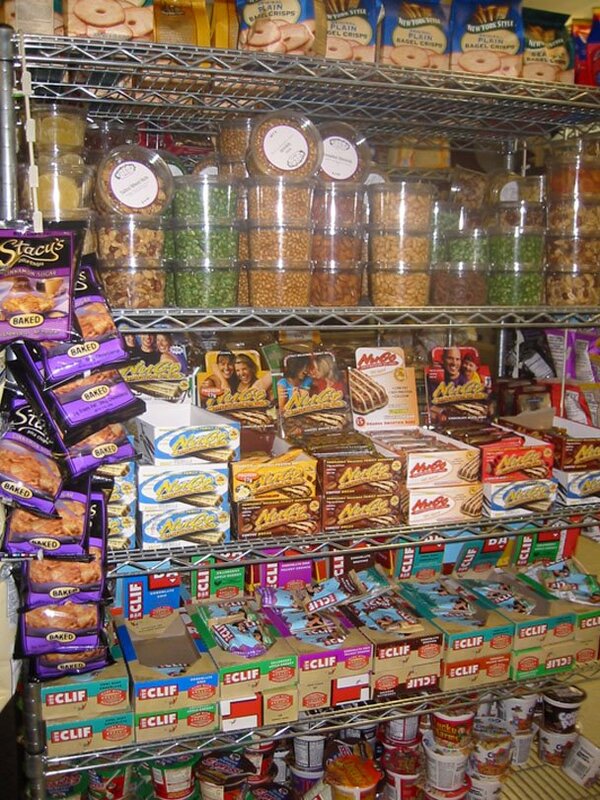 Look at some of the pantry snacks being sold! 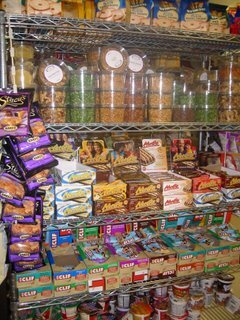 Dried fruit, dried peas, bagel chips, Clif bars, Walker shortbread, Terra Chips, Cibo chocolate, Toblerone, Carr Crakers, Kavali flat bread, organic cereal, nuts of all kinds, baked potato chips, etc. In the cold case, there were lunch boxes made up with fresh fruit, micro green salad, lentils, tuna, and quinoa. Yes, QUINOA, one of my favorite side dish grains. Where can you get quinoa in Nashville? Definitely not at the airport! Because we already ate a nice hot breakfast before leaving for JFK, we only wanted snacks. 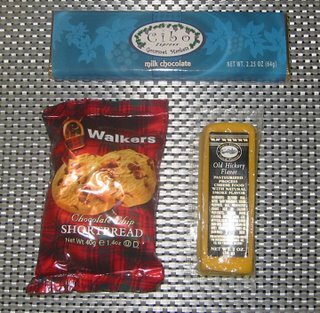 Here are some of our snacks. Here is the rest of our snacks. 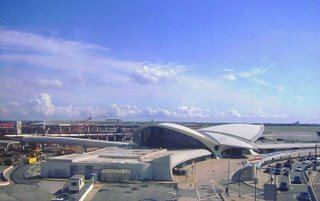 Here is the future terminal for Jetblue. 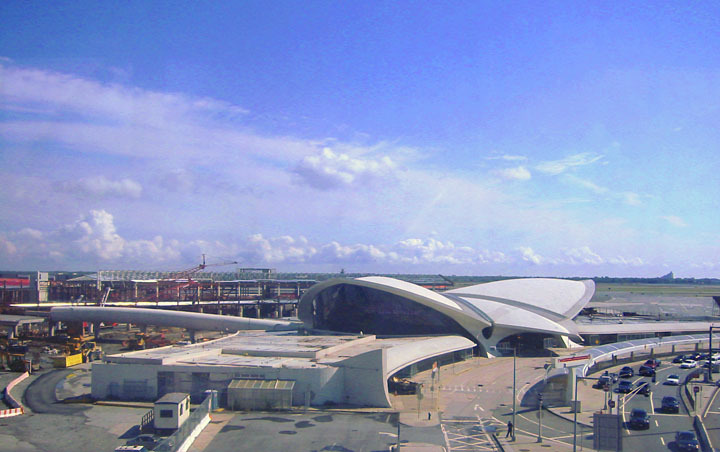 It is the old TWA terminal. 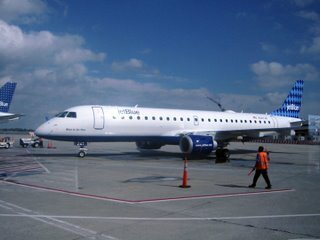 Here is our plane, and we had to get on, if we wanted to get home. OK, we are back. And I am ready to take another trip to New York. I just had a great time enjoying the spectacular autumn weather, seeing family and friends, seeing neat things to photograph, AND EATING really excellent food. Also, note to self, bring breakfast with me to BNA because terminal food is either bad or non-existent. 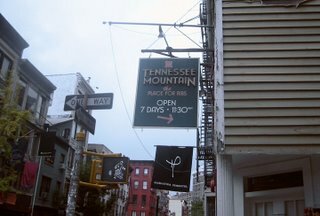 This is my last blog entry about this New York trip, and I have to return to the daily life of Nashville. Before I go back, I just want to think about the visuals of ordinary life in New York. There were so many thing and places to see, and all of them were stunning and photogenic. I ran out of room on the camera card, so I had to pick and choose which scene to keep, and which to delete. These are three of my favorite pictures of the abundance within little store fronts. 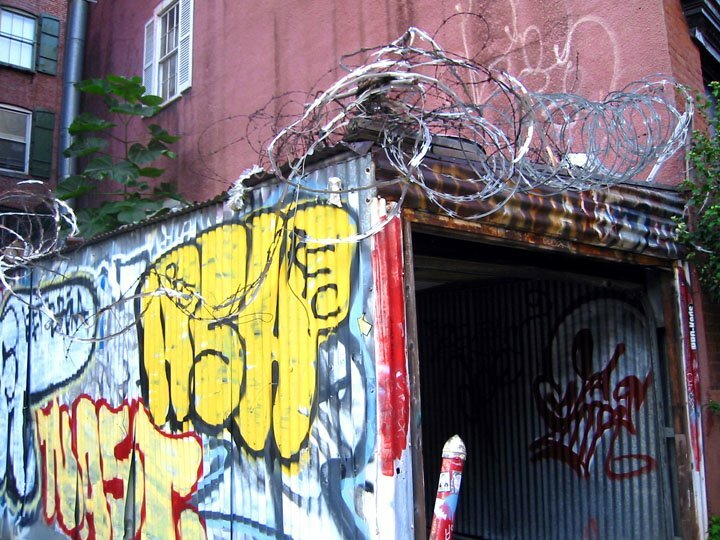 I love looking at these pictures because views like these going on all over the city, and these photos just make me think of the humanity that thrives behind every door in New York. 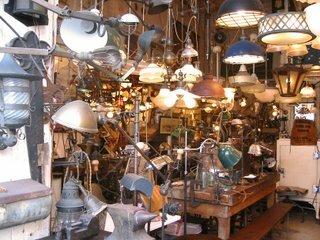 Used and antique light fixtures for sale. 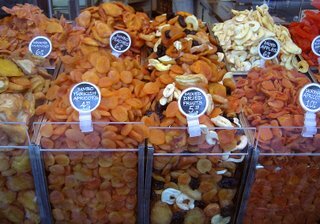 Treats like dried fruit, handmade candy, teas and deli specialties like belly lox for sale. 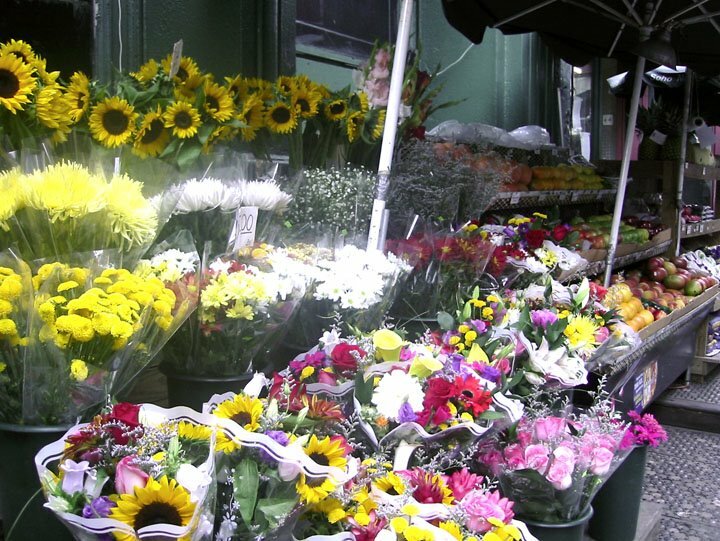 The first flower and fruit stand in the city. A classic combination of gifts for your sweetheart! 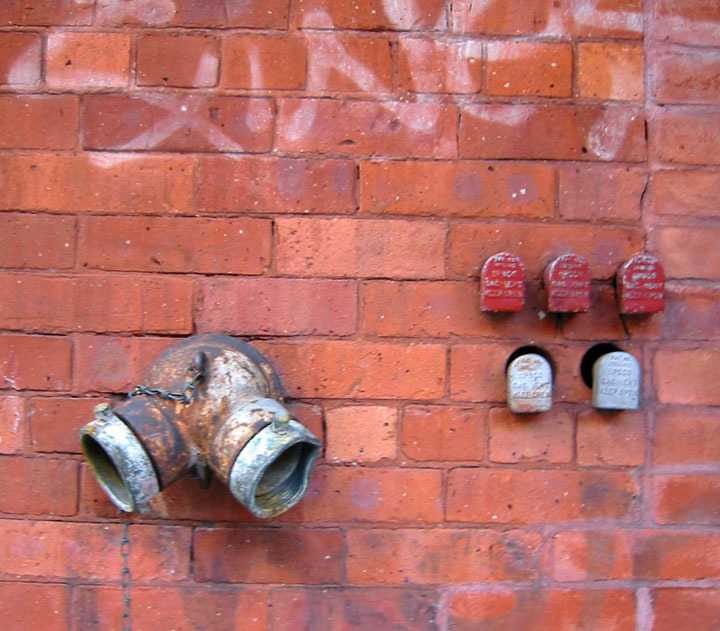 New York is just a photographic city from all sides, from underground to above ground. There are interesting things to see all over the city. 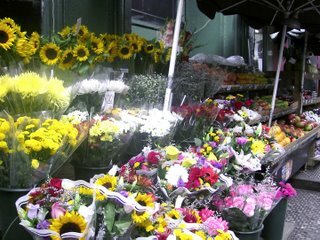 Here are a few pictures from a walk through SoHo, East Village and Greenwich Village. Things sticking out of the front of a 3 story rowhome (brownstone, attached home, townhouse, or whatever word you want to use). I don't mean to make a deal of what to call this type of building because anyone who has ever lived in a big city knows what a townhouse or brownstone means. I was recently at a cocktail party, and someone was making fun of me for referring to a brownstone as a home, and she would not let it go. She kept on saying how stupid I was for referring to a rock, or a pebble as a house! Anyway, she obviously just crawled out from under a rock herself. 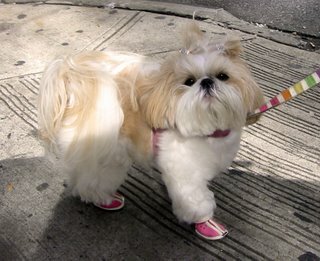 Yeah, people and their dogs in Manhattan. 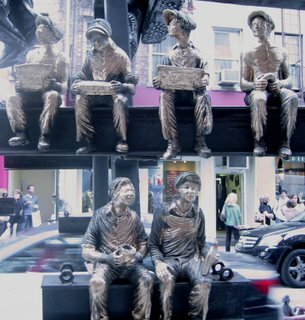 These are cast iron figures of iron workers. I noticed this sign saying Tennessee Mountain, the best place for ribs, in the middle of SoHo New York. Do you really think so? I think that I know where the best Tennessee ribs are really from: That would be Cozy Corner Memphis, Jack's BBQ Nashville, and my own back yard with Matt and his Texas sized smoker. Yup, these establishments and my home are in the fair state of Tennessee, not the city of New York. The reality is that there needs to be a lot of hard wood smoke all morning and afternoon to make a perfect Tennessee smoky rib, and I did not see any of that happening at TN Mountain in NY. People of New York think that their local Tennessee style rib joint is good, but that is because they never had the real deal. I invite all New Yorkers to try some real Tennessee BBQ at any time of the year. Come on down! NOW, this is what New York is famous for. It is the pizza. 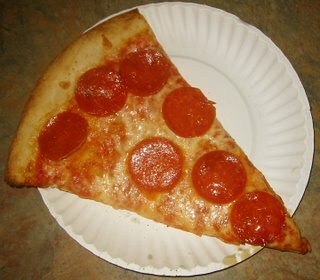 I will admit that Tennessee is missing out on really great New York style pizza, and the only place you can get really good New York style pizza is in New York. We just walked up to a pizza kiosk - hole-in-the-wall, and got a great piece of pizza. Ah, now that is New York! 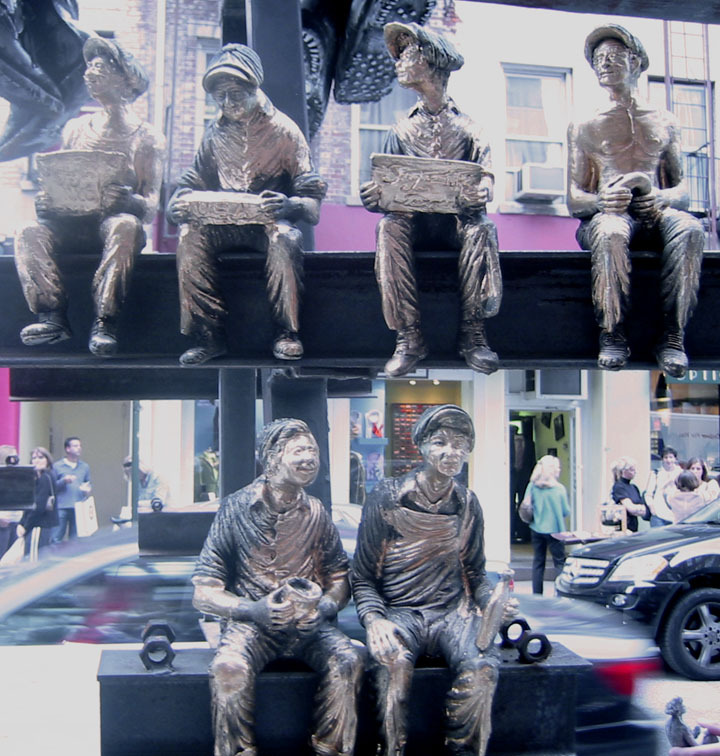 Right now, New York is a very photographic city, with a lot of amazing things to capture on giga-bytes and film. 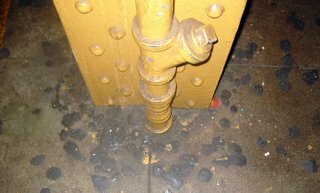 Back in the 1980s, Times Square was kind of a s**t hole, and honestly, when I was in Times Square 5 years ago, I had no idea where I was. The subway stop is clean, and above ground it is clean, neon and huge stores for CNN, Nike and the like. It is not the Times Square of 25 years ago. This visit, the only thing I saw of Times Square is the subway stop. I had said this whole trip that NYC is an incredibly photographic city, and I could have filled the GB chip in the camera. Underground NYC is just as photographic. This is what I saw of Midtown - the Times Square subway sign. 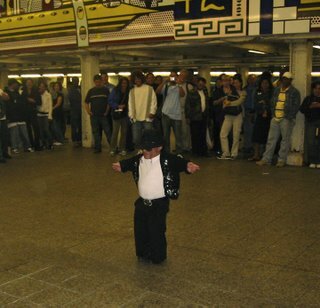 At the transfer deck of the Times Square subway stop, there was a mini-Michael doing the moonwalk to Beat It. I wish we had a camcorder to put his dance on YouTube. 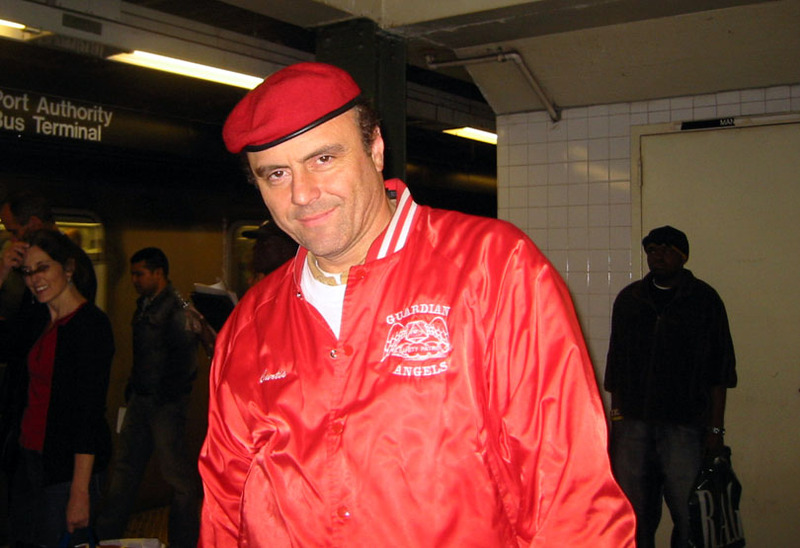 Amazingly enough, we were lucky to catch up with Curtis Sliwa, the founder of the Guardian Angels, while waiting for our train at Times Square. If you can recall back about 25 years ago, Times Square was completely sleezy and unsafe, especially for the New York Times reporters coming and going out of the New York Times building day and night. 25 years ago was around the time that New York was suffering from funding cutbacks. Services for the people were being cut or stretched to new bounds. Mentally ill wards of the state were just let out on the streets of New York because of a new law to protect the rights of all people, and innocent people could not be held against their will. 25 years ago, there was a growth in crime in New York. During that dark time in New York, the Guardian Angels were born in New York as a volunteer community group to reduce crime with non-weapon tactics, and the Guardian Angels made riding the subways safer than ever before. Thanks Curtis, for 25+ years of volunteer service to the people of New York, and tourists that visit all year long. Good job! A funny thing I notice about all subway stops and underground subway connector tunnels in New York- There are all these black dots on the ground, about a quarter in size. I surmise that they are all old gum ground down flat with dirt. I wonder how many gum dots there are in all the underground subway stops in New York? Anyone know the answer? There are some people who have cars in Manhattan, but I suspect there are quite a few people without cars. There are plenty of sidewalks, subway lines, taxicabs and even ferry lines that can move people to and fro from borough to borough. When I used to live in Philadelphia, I used to take the R5 to the R2 to the New Jersey Transit to Penn Station in New York. It was about an hour and half ride, so I got to read, listen to music or nap. It was great. On occasion, my former roommate would drive up and take his car into Manhattan. He would try to street park, and on every occasion that he did this, his car would either be broken into, vandalized or towed by the city. It is just not worth it to drive into Manhattan in my opinion. Check out these people who have cars in Manhattan. Look at this parking lot. There is enough room for 104 cars in the 2 deep, 12 across and 4 high parking lift as well as 48 surface spots. 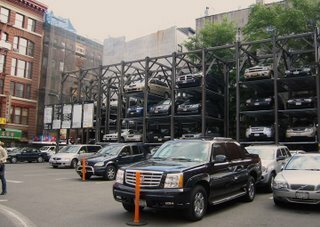 I wonder how long it would take to shuffle around the cars if a car in the top back had to be taken out, and all the surface spaces are taken. Check out this personal parking garage on a block just south of SoHo. In many ways this looks like a completely crappy place to park a car. 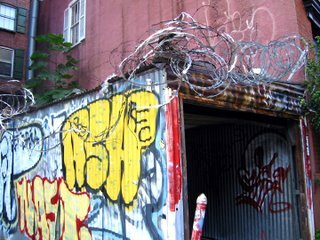 In most cases, it is crazy to have barbed wire on top to discourage people from jumping on top of the aluminum room and damaging the garage and car. BUT, who ever owns this rarity of a personal parking spot is really lucky and probably wealthy! What do you do on a drizzly Sunday morning, when you find yourself waking up on the Upper Westside in New York? You call your best Yuppie and say, "Dawling, let's do brunch!" That is exactly what we did. Thank goodness New Yorkers stay up late, and get moving in the morning late. This low energy morning, we strolled over to Isabella's at about 11:00 am, and the restaurant was just barely getting started. An hour later, it was going to be a long wait for some patrons. 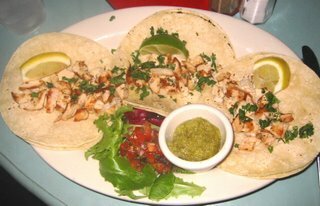 Isabella's is in a very residential neighborhood, and it is a place to "see and be seen" for the native Upper West and Eastsiders. There isn't a whole lot of tourists eating at Isabella's because it is about 20 blocks north of the most northern midtown hotels, and it is not marketed towards tourists. Great for me because I was seen by New Yorkers (and not by my tourist peeps), and the natives could probably pick me out as a tourist because I have not lived in a real city for so long, and I now dress like my cousin Marjorie from Nebraska! At least I am not wearing grandma jeans (note, I am not old enough to be a grandma, and until then, I will resist buying grandma jeans). Anyway, Isabella's is also a part of New York's power restaurant group, B. R. Guest who also owns Blue Fin, Atlantic Grill, and Blue Water Grill in Chicago and New York. Because Isabella's is a part of this restaurant group, the food was dead on, the wait staff was great, and the restaurant was one of the first in New York to make sidewalk cafe dining chic. I want to first talk about the coffee. I got the perfect cup of coffee. It was coffee, and I put a dab of cream and a little raw sugar in it, and I sipped it while saying, "Ahhh!" It was just a good cup of coffee. I think that most of the USA has gotten to a weird headspace about coffee, with having to have way too many descriptors, like a double half caf half decaf skim soy milk three quarter foam extra heated sugar free organic cocoa violet extract charcoal filtered latte. Now look, any coffee bean roasted more than a day ago is stale, no matter if it is ground the day of roasting, or right before the coffee is brewed. Back in the 1980's when I lived in a real city with access to excellent coffee and beans, I used to be a coffee snob. These days, I have simplified, and I just enjoy a really good cup of coffee, and a little cream or soy milk that I add myself. Thanks Isabella's for serving JUST COFFEE. Just Coffee is a lost art, and Isabella's does it so well, that I could completely take it for granted. OK. What did we dine on? 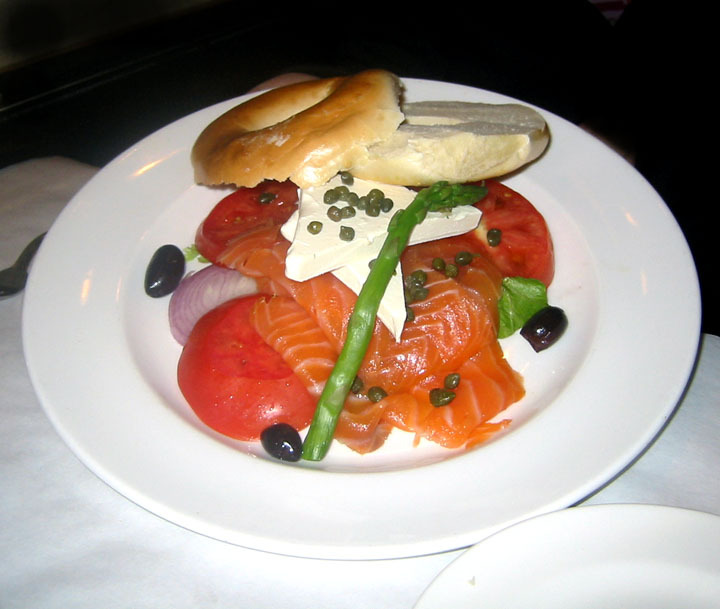 Of course, in good New York brunch style, we got Nova Scotia Lox. Here is what the Young One got. How perfect. A bagel not toasted because no good Jewish New Yorker would dare toast a perfect New York bagel. Toasting bagels is left for the inferior bagels from the freezer or bad bagel chains. Young One opted wisely with the bagel, lox, cream cheese, capers, tomato and red onions. What a beautiful plate. Young One was very happy. 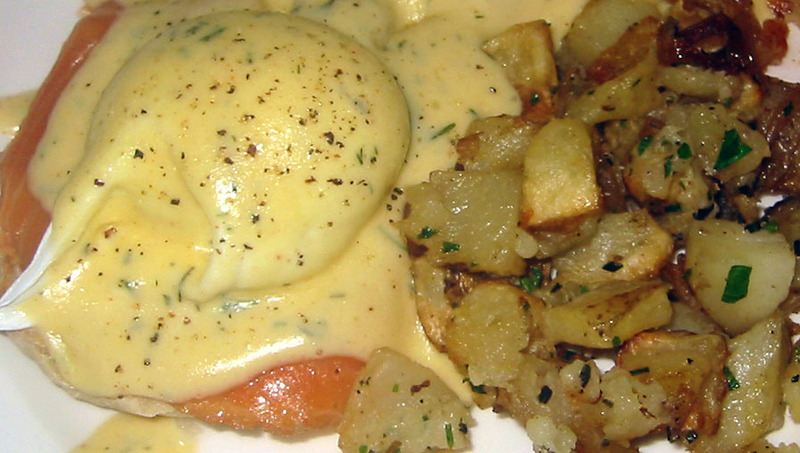 A couple of us opted for the Eggs Benedict made with lox, not Canadian Bacon. Come on, we are in New York, so why would you not go for the lox? The eggs were hot, and it was obvious that the waitstaff served my plate right away, and there was no heat lamp to speak off. 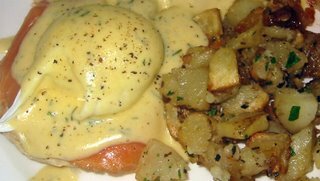 The Hollandaise sauce with dill was fluid and buttery, and not dried out from sitting too long waiting to be served. It was as perfect as you can get for serving my brunch plate. Matt got the breakfast burrito. 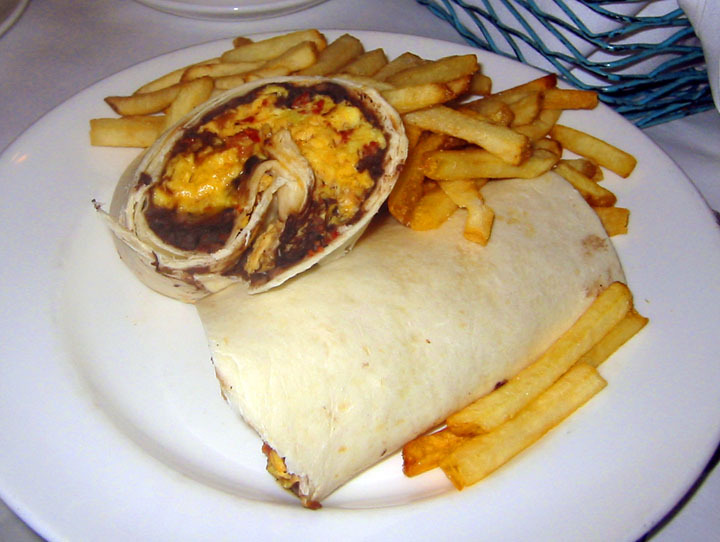 Yes, they have a breakfast burrito here. He really likes the breakfast burrito, and I think that he really enjoyed his burrito. This place produced breakfast well, and solidly. There were no putting-on-airs about the ingredients or preparation. Rather, this kitchen prepared and presented traditional recipes in a traditional way, and in the way I really wanted. There was none of that smoke and mirrors such as crazy ingredients that don't belong, or fusion in all the wrong way. The food here will stand the test of time, the waitstaff understands how to deliver dishes straight from the kitchen, each dish is perfectly hot, and Isabella's pours one good cup of coffee. This isn't the East Village of your grandmother's anymore! East Village is a hip area of New York with lots of young East Asian tourists who want to strut their stuff and be as urban chic as possible. East Village has some of the best bars and restaurant in New York that are reasonable in price, without the snobbery of Midtown, and with hard working chefs making their mark on the culinary world. 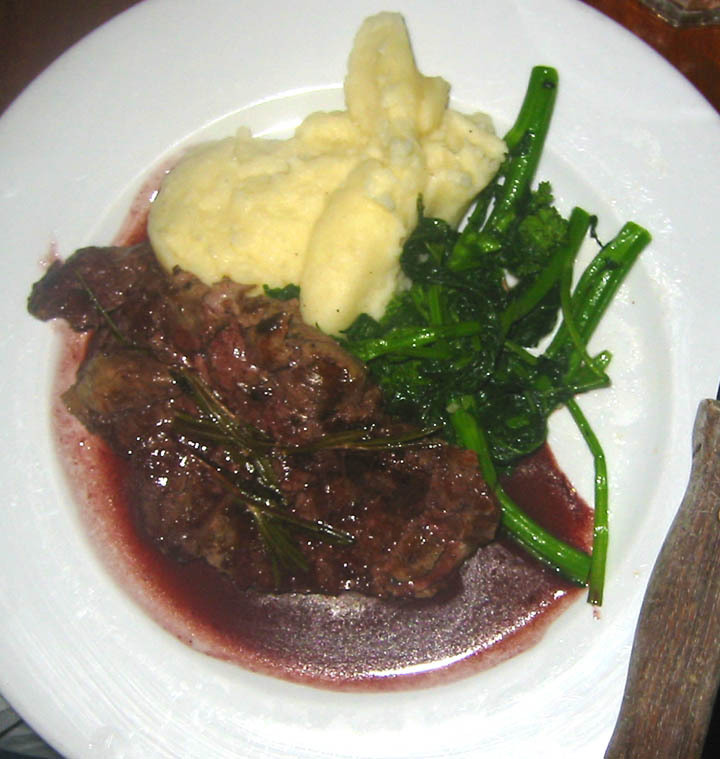 Paprika may be the best example of new Italian in East Village. Homeboy and Homegirl eat at Paprika often because the food is created simply and consistently. Our Saturday night at Paprika was no exception. I started off with carpaccio made with truffle oil, braised lettuce and Parmigiano cheese. This is a simple dish made to perfection. Four of shared this dish because it was so large, and it was only $9 total, or $2.25 per person. The flavor and texture were perfection. The truffle oil added just the right aroma, that I can sit here now and imagine the earthy sensation I had in my nose while I savored each bite. This dish was just excellent. Matt got the nights special of steak with red wine sauce, mashed potatoes and braccoli rabe. I did not hear hide nor hair from him, so I suspect that he liked his dish. I had homemade gnocchi with prosciutto, sage and homemade tomato sauce. The gnocchi was pillow and light. The sauce was flavorful and light as well. 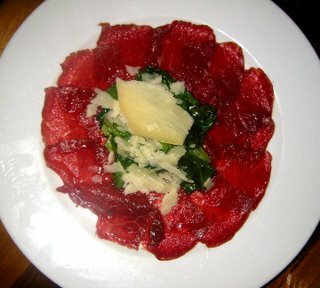 The prosciutto strips were a delight to have as a textural contrast to the lightness of the gnocchi. The most amazing part of this dish is that the gnocchi made fresh that day is only $10.50. 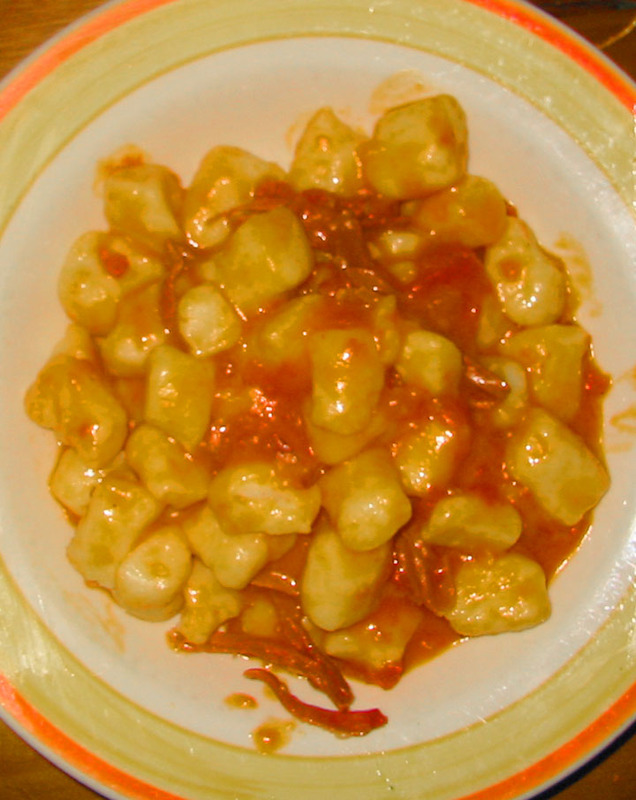 Where I live, there is no real Italian haute cuisine, so there is no fresh gnocchi to be had, unless I make it myself. There is great effort to make gnocchi including preparing the potato, getting the right mix of egg and flour, and not having too much water. There are a lot of things that can go wrong during gnocchi making. 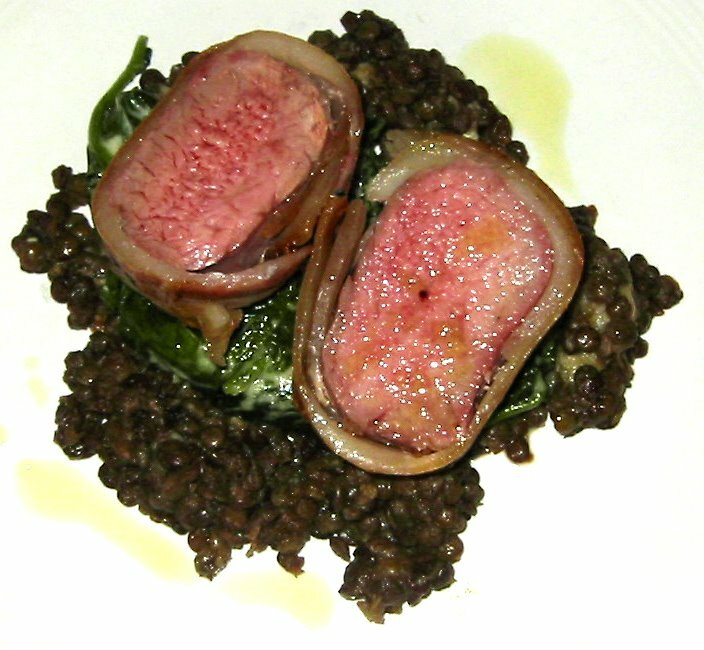 I think that this dish is worth more that the list price, but I am not going to tell the owner. This was such a lovely evening. There were a dozen of us in New York, to welcome back Homeboy and Homegirl. These two spend about 6-9 mo. in New York working, and living a very urban life. They have a small apartment - a walkup to the 5th floor, they have no car, so they walk and take the subway everywhere, and they work hard in the city, like most New Yorkers. Then, Homeboy and Homegirl spend 3-6 mo. in a cabin, on top of a mountain where the population is 50, and not one restaurant. Their cabin has no running water, no electricity, no washing machine, no dishwasher, no TV, and no wi-fi. The cabin has a well, a wood burning stove that serves as a stove, and an outhouse. Nothing goes to waste, and anything that can burn goes into the stove. It was so fun to welcome them back into the most urban city of the USA, and share a meal at their neighborhood restaurant! 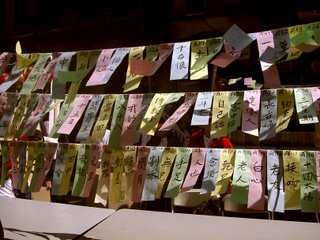 This year, we were so lucky to be in New York Chinatown on September 30, the day of the Autumn Moon Festival in New York City, with our families. We got to share dim sum and tea. In many cultures offering and sharing a meal, a sweet treat, breaking bread, or pouring hot tea for another are significant gestures of friendship and family, and the feeling of the offer runs deep into the souls of one's being. This is very true for Chinese. The greeting Chinese have is Sic Fan Ma? meaning Have you eaten? And then, the host will offer food, and put food and hot tea on the table as deeply felt gesture of friendship and family, even after the guest insists that they are stuffed to the gills from just eating. For me, the action of sharing dim sum, on this special day, with my family and friends was very significant and will always be a very happy memory. After dim sum, we then went walking around Chinatown to see what we could see, and see what the street vendors and street artists had to offer. I love the street vendors because you never know what you will happen to see, and it might be just the right thing that you did not know you wanted. The all Chinese American Color Guard were just about ready to present the flag. This is one side street in Chinatown during the beginning of the Autumn Moon Festival street bazaar. At the very back side of the photo, there is a stage. When we walked by, there were the New York City Lion Dance team just arriving with their Lion heads and feet ready to roar. I love the Lion Dance because the Lions are cute, and remind me of my kitty cat when she is pouncing on her toys. I have one more comment about the picture above. There are a lot of people out on the streets of Chinatown on Autumn Moon Festival, Saturday afternoon. 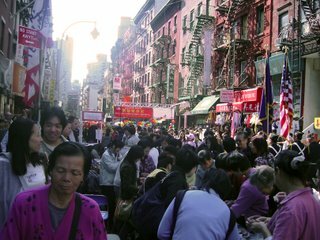 There are ALWAYS a lot of people out on the streets looking a the vendor's wares on Satuday afternoons in New York Chinatown. I am wondering if there were more during the festival day, than on any normal given Saturday. 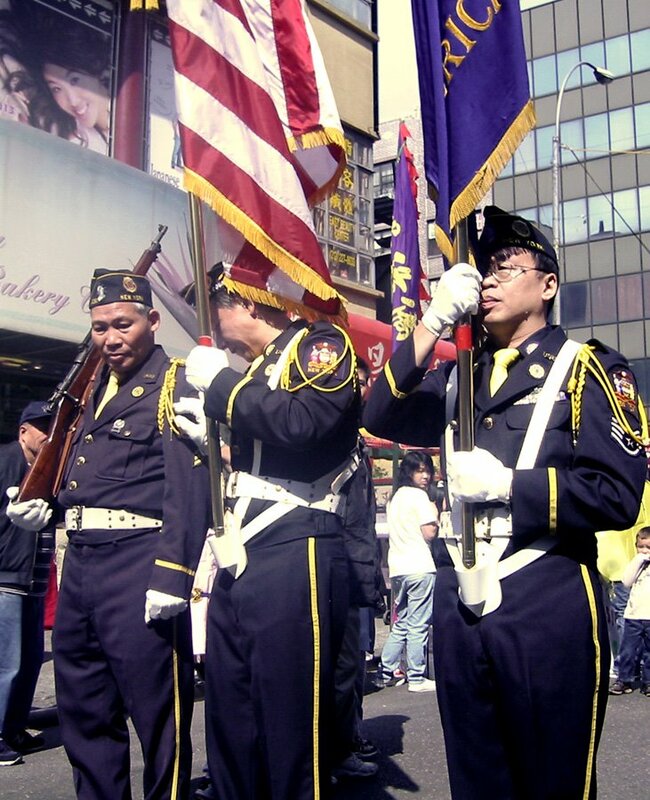 For whatever it is worth, there is no other Chinatown in the USA that has the this large of a crowd. I love the energy, the liveliness, the rawness, the people watching, the goodies the vendors sell, and it makes me feel human, grounded and connected to other people again. I must get back to this at least once per year! I am not sure what these are. There were ropes strung across a few poles with these papers flying. I am guessing they have names on them maybe? Does anyone know what these are? 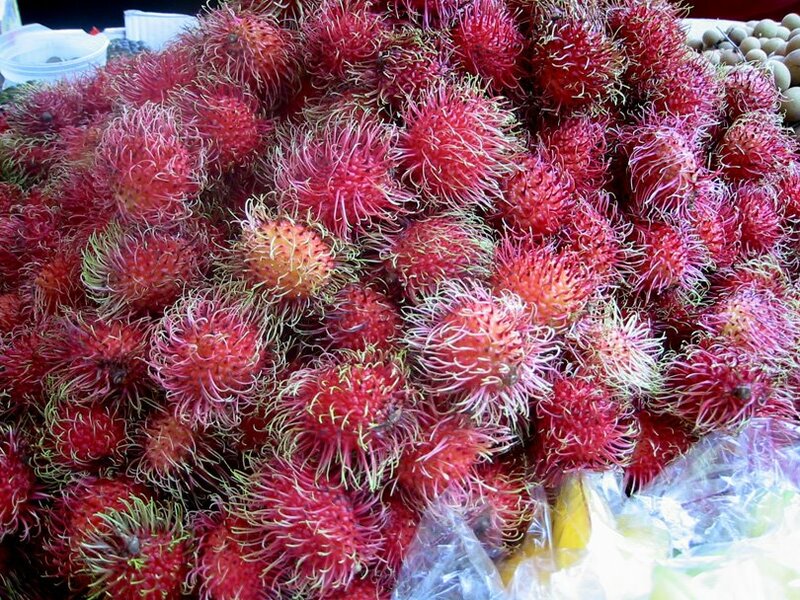 One Chinese street vendor had these fruits. 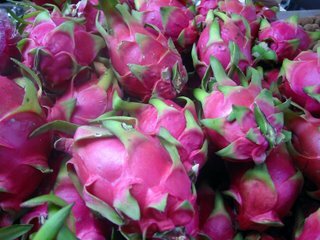 They are about the size of a large apple, and have the most lovely pink and green exterior. There was one cut open for us to see, and the inside looked like a giant fig, with lots of little black dots in the center surrounded by a tan-grey flesh. What are these, and what do they taste like? 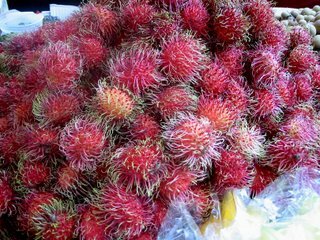 Here is another fruit at the same street vendor's podium. These are the size of a lychee, but furry looking. They bright red color is so pretty. I do not know what the inside looks like. Does anyone know what these are? For our 2nd dinner in NYC we hopped on the F train to get to an area of Brooklyn called Park Slope, next to Prospect Park. This lovely tree lined, gas lamp lit and brownstone homey is home to a few local restaurants catering to those who live in the area. 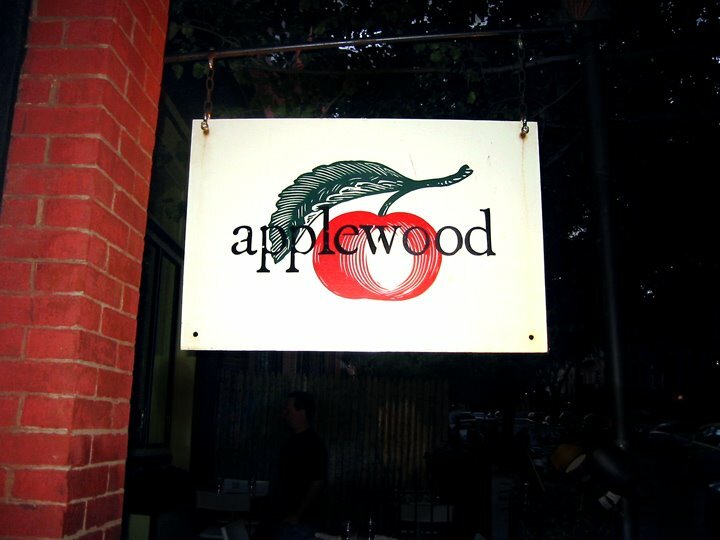 Applewood is one of the boutique restaurants that caters to the locals. We started off with the complimentary bread and spread consisting of a garlic cream cheese, French butter, and a lentil spread. All very good with the wood oven bread. 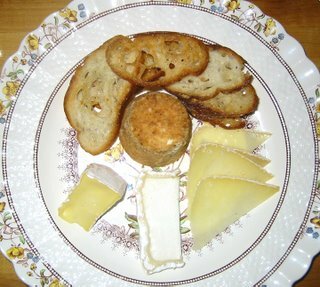 For starters, the one plate that was excellent was the cheese plate, in a portion that should be for two or more. There was a cows milk cheese, a sheeps milk cheese, a goat cheese, and a blue cheese cake served with a few home made Italian bread chips. 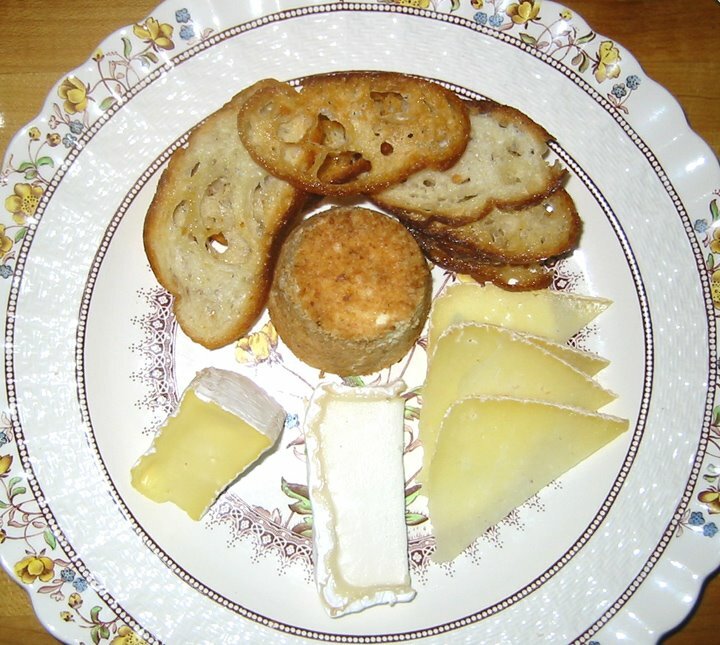 The cheeses were of exceptional flavor, that they could have served half as much, and we would have been fine. I should not have done it, but I did it anyway. 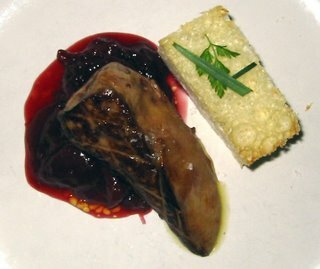 Two of us at the table got the foie gras with a cherry compote as a starter. Again, the portion was way bigger than anyone should be indulged. I finished it. I have only had foie gras as an adult twice, and the other time was earlier this year. Laura, one of the owners of Applewood said that all the meat they use comes from an organic farm in upstate New York, and that there are humane practices used to raise the animals. There was no direct answer of whether the foie gras came from a goose that was raised organically in upstate NY, and judging by the size of the piece of foie gras on my plate, I doubt it was. At anyrate, I enjoyed the foie gras, and while I ate it, I thought that this is probably the last time I ever have it until better farming practices are put into place. I gave up eating chicken and pork for many years after spending some time in Central Missouri where there is the largest concentration of industrial pig and chicken farms than any other area of the USA. When the wind blew the wrong way, there was that un-managed industrial farm pig poop smell for days. This smell carries for miles, no matter what anyone tells you. The rotting crap smell permeates every fiber of clothing, so even after the wind changes, the smell is the carpet, in the jacket, in the shirt, etc. The stench just made me want to vomit, it made me sick to my stomach for days on end. Having been at PennState, where they take their animal husbandry quite seriously, the pig barns were clean, and the pigs seem to be as happy as pigs s**t, but not be in s**t. It is possible to raise pigs in a sustainable way and that don't stink to vomiting proportions. Anyway, a decade later, I am ok eating organically raised pork now, but I still have flash backs to that horrible industrial farm stench. These industrial farms are the definition of Gross Out stench! Being so grossed by pork was difficult because there is a Chinese braised pork belly dish made in a clay pot with 100 cloves of garlic and root vegetables, like lotus root, that is to die for, and I gave up this dish too. For those who are fortunate to have had this Chinese style clay pot braised pork belly with lotus root know how fantastic this savory dish is. 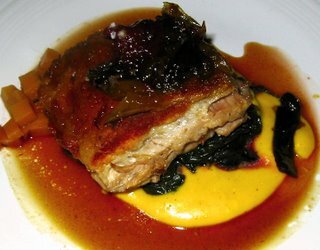 I don't ever remember being in a USA restaurant, besides a real Chinese restaurant to offer braised pork belly, so I had to try Applewood's organic braised pork belly. Applewood's translation of braised pork belly was interesting because they kept the traditional European influence of serving pork with a sweet sauce over greens, which may be collards, but I cannot be certain, and diced yams cubes. Again, this was about twice the size it needed to be. I unfortunately ate the whole thing, and as I sat there, the pork belly started to expand in my belly, and I felt like I just ate a Thanksgiving meal. It took a few hours, a nights rest and a 6+ mi run around Central Park to make me feel unstuffed again. Because we were in NYC, and we have already hit 2 of the 3 questionable farming practice meats (foie gras and pork), why not round out the table with #3, veal. A couple other people at my table got veal tenderloin medallions wrapped in homemade pancetta over greens and lentils. I hear it was very good. I did not get to try it because, as you have read, I had my own huge portions to contend with. The others at my table ordered dessert, I did not because I was just too full. What was ordered was a mint ice cream sandwich with two chocolate cookies, and a dish with homemade chocolate ice cream. A small taste of the ice cream was enough, it was flavorful and very good. Then there was also a poundcake made with olive oil instead of butter. The co-owner, Laura, a stereo-typical high strung, fast talking, Chicago woman transplanted in New York, kept on talking about the olive oil pound cake all through our dinner, and was a bit forceful in wanting us to order this cake. It was almost like a Seinfeld episode when Jerry's parent's neighbors kept on insisting that Jerry should "Take the pen!" Laura kept on saying, "Take the poundcake!" Was she trying to sell it because it was good, or was she just trying to get rid of it because there was too much of it in the kitchen? The table did not order it, so she had the waiter bring us a plate of it anyway. 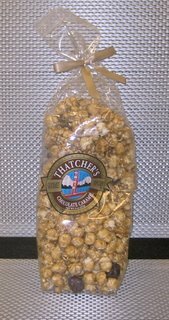 I did take a bite of that, and I did not care for it at all, and I had to do a chocolate ice cream taste chaser. It was strange because the poundcake was grainy and dry like a cornbread, but oily at the same time, if that is possible. It did not have that buttery flavor that one longs for in a pound cake, because it was made with olive oil. Oh well, 2 out of 3 desserts ain't bad.